The unsolved homicide of Ellen Fried. Ellen Ruth Fried, age 26, was last seen talking on a payphone outside of a convenience store in Claremont on July 22, 1984. Her skeletal remains were found in a wooded area next to the Sugar River in the Kelleyville area of Newport, NH on September 19, 1985. The autopsy revealed the cause of death to be undetermined because of the skeletal remains that were found. 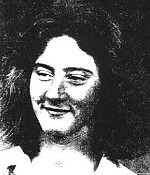 However, the circumstance of her disappearance and the findings at the scene were consistent with Ellen having been sexually assaulted before her death. The case has been treated as a homicide.